In a city where the eating is as good as it is in Philly, naming 50 great restaurants is a cinch. Naming the 50 best, and doing it in order? That’s tougher, but it’s what we’ve done here. You may not agree with all of our picks. Hell, you might not agree with any of our picks. But this is our list, and we’re sticking to it. 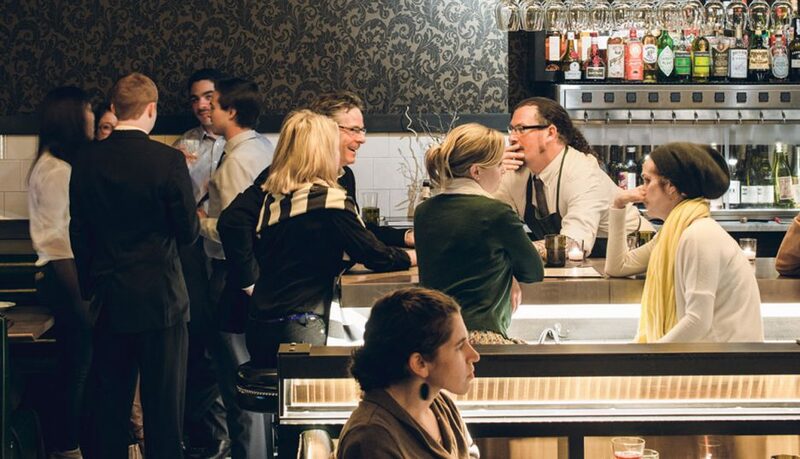 So without any further ado, here they are: the 50 best restaurants in Philadelphia. Bon appetit. When we first heard Nick Elmi’s name, he was cooking under the tutelage of Georges Perrier, but beneath the weight of the Le Bec-Fin reputation. At Rittenhouse Tavern, we saw more glimpses of Elmi’s talent, but there was also the grip of a corporate overlord dictating much of his menu. 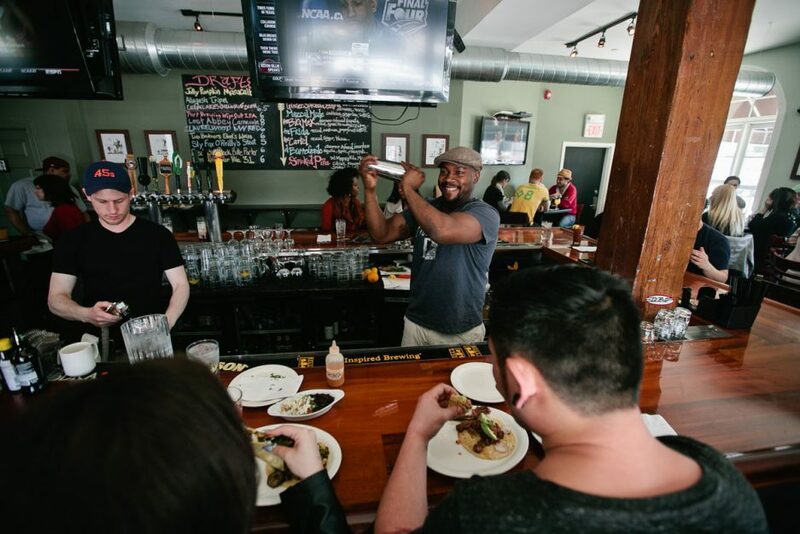 Then we watched Elmi find himself, of all places, on television, during his winning season of Top Chef. 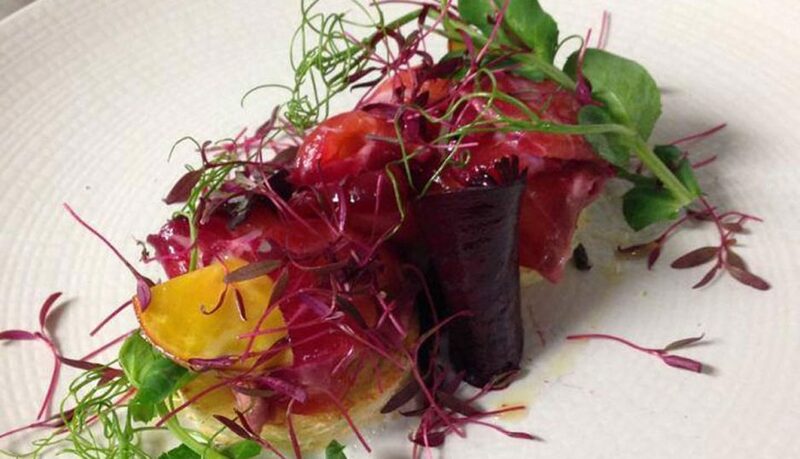 Now Elmi has his own restaurant, and here, the chef shines from the first bite of chilled tuna and horseradish to the final forkful of dessert. Elmi works wonders with one well-conceived plate after another, all from a tiny kitchen in a small BYOB on Passyunk Avenue, and Philadelphia is the lucky beneficiary. 1617 East Passyunk Avenue, East Passyunk, 215-271-8299. Whether you’re looking for the country’s best bread basket, the next big thing in fermentation (sunchokes one night, parsley the next), or the revelatory taste of something burnt to unexpected perfection (like charred wheatberry pappardelle), chef Eli Kulp has galvanized Ellen Yin’s Old City institution with cooking that’s at once deeply rooted, exuberantly adventurous, and as polished as Yin’s trademark hospitality. 306 Market Street, Old City, 215-625-9425. The way the story usually goes, a restaurateur comes to town, starts out strong (or at least with high expectations), opens big, and then slowly fades into the background radiation of a scene so overcrowded with bright new stars that none remains the center of the culinary universe for long. What almost never happens is for a place to open well and then get better — and yet that’s just what Vernick has done. 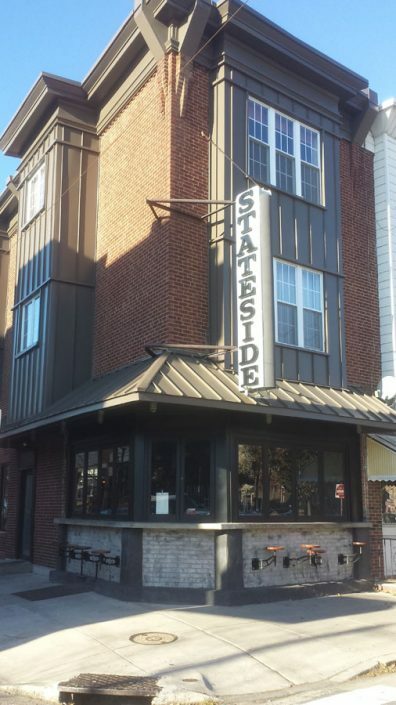 From the first bite of its now-trademark toasts to some of the most impressive high-end New American cuisine in the city, Greg Vernick and his crew have created a neighborhood restaurant that’s a favorite of almost everyone in town. 2031 Walnut Street, Rittenhouse, 267-639-6644. Ten years after planting his BYO on South Street West, Ian Moroney is still the guy cooking your dinner — only “I kinda know what I’m doing now,” he says. That’s a major understatement. With healthfully balanced meals built from an ever-changing list of knockout dishes like burrata framed by roasted, pickled and pan-seared peppers and caramelized seckel pears, or skate wing beached on an island of braised broccolini, Moroney does complexity and simplicity with equal elegance, making this unassuming 26-seater the gold standard of contemporary seasonal cooking. 1713 South Street, Grad Hospital, 215-545-4448. Kevin Sbraga may be an honest-to-Jesus celebrity chef, but he’s far from an overnight sensation. 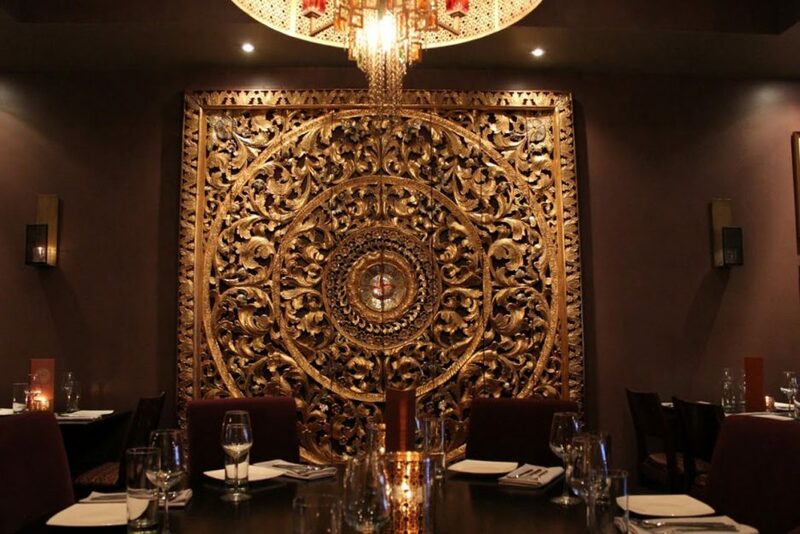 The menus at his first restaurant just keep getting better, and these days a dinner at Sbraga is a dud-free experience, displaying excellence in everything from Indian-influenced fried chicken to service that defines hospitality in a post-fine-dining world. 440 South Broad Street, Center City, 215-735-1913. 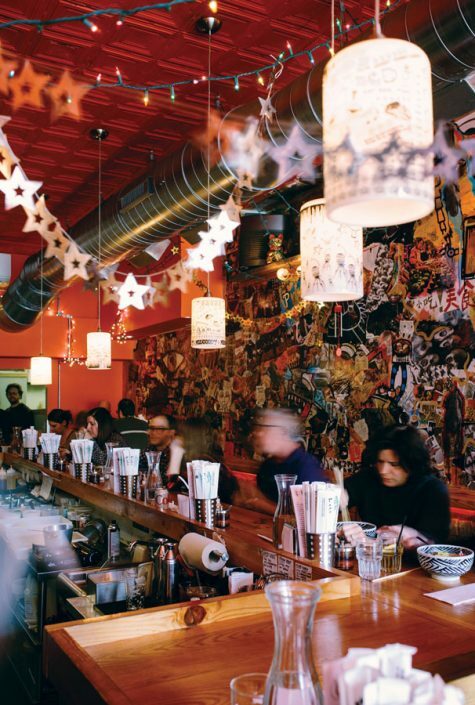 Vedge is the restaurant that turned Philadelphia into a destination for vegans. And as ridiculous as that might sound for a city that’s also home to the Cheesesteak Vegas at 9th and Passyunk, if you’re one of the 11 people in this city who haven’t yet experienced what this kitchen can do with something as simple as a radish or a carrot, you owe it to yourself to go right now. 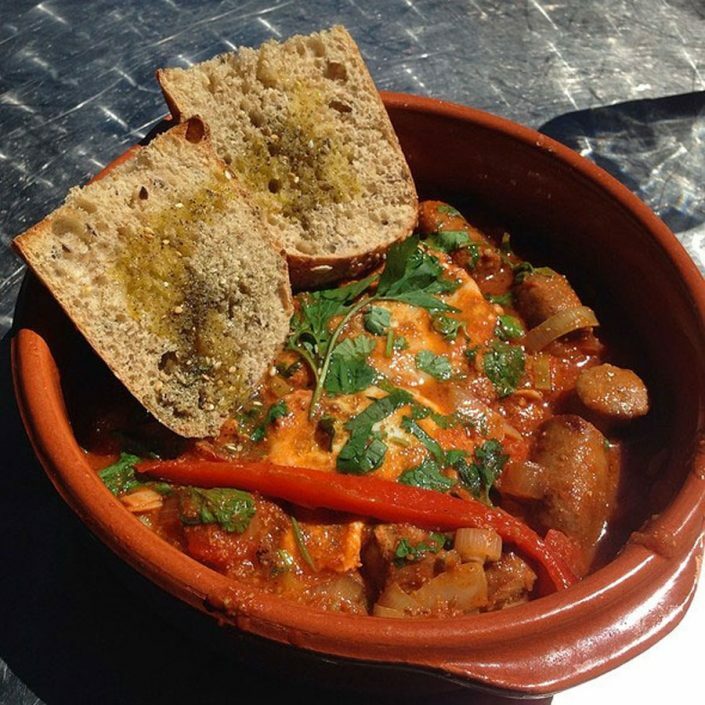 Vegan or not, it’ll be one of the best meals you have all year. 1221 Locust Street, Midtown Village, 215-320-7500. 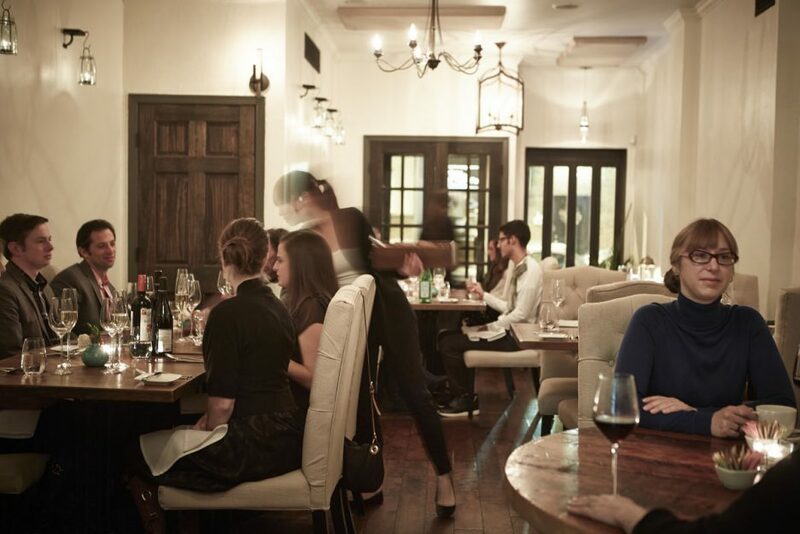 Townsend — both the chef and his eponymous restaurant — executes exactly as promised. 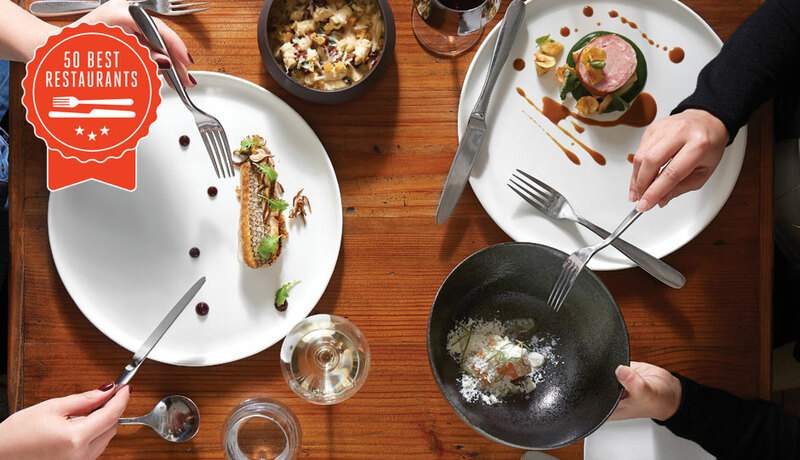 Upon opening, chef Townsend Wentz called his restaurant “French.” Not “French-inspired,” not “French-American,” not “contemporary American using French techniques” — just “French.” And his food is exactly that, done spectacularly. His escargots, foie gras mousse and beef tartare, staples of the cuisine, are now the new bars raised for any French restaurant in Philadelphia — and those are only starters. 1623 East Passyunk Avenue, East Passyunk, 267-639-3203. 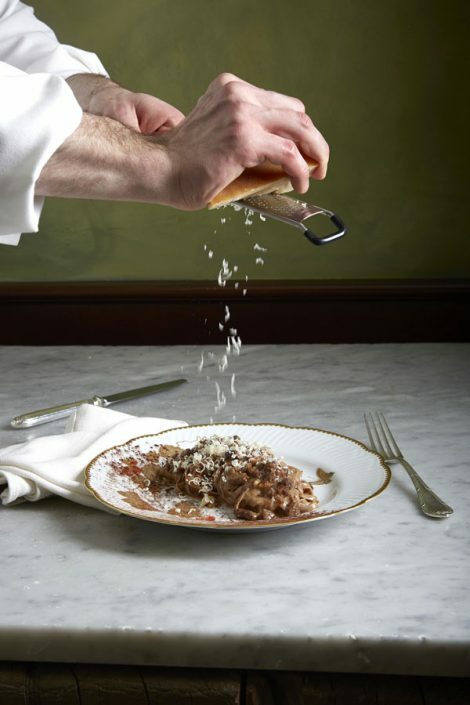 Dinner at Vetri is a performance, with each element of the dining experience executed in perfect harmony. 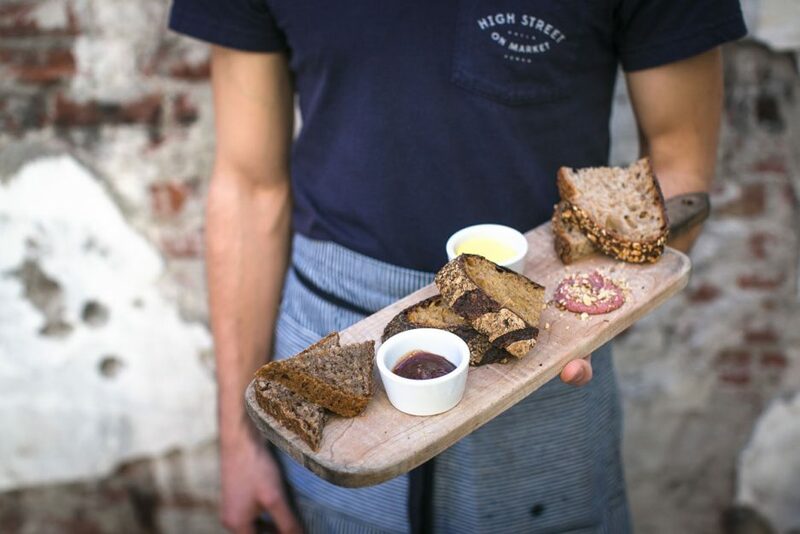 Before a menu is delivered, a plate of snacks is brought, designed just to impress. And the menus themselves are merely suggestions. 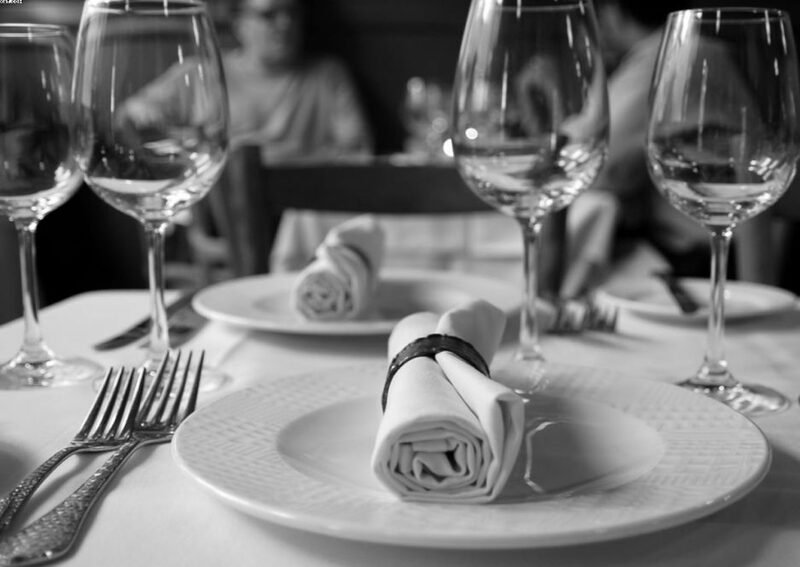 Pick what you definitely want, or would like to pass on, then sit back and enjoy the work of a restaurant that truly excels. The pastas stun, the mains are as creative as anything being turned out in the city right now, and the service is beyond reproach. 1312 Spruce Street, Midtown Village, 215-732-3478. 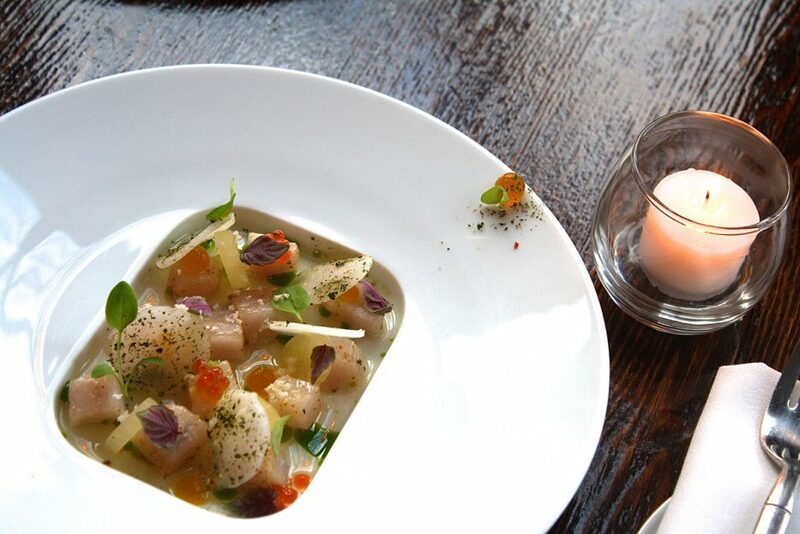 Serpico sets the standard for what all upscale-casual restaurants should strive to be, carefully balancing ballsy culinary badass-edness with a guest-first mentality. It’s not only one of the most visually stunning restaurants in town; it has a menu that defies definition by any simple label, yet feels totally dead-on for today’s tastes. You’ll find a parade of memorable internationally inspired dishes with flavor combinations and mash-up cooking techniques (chili dumplings stuck to a crispy nest, a beef pho sandwich) that feel totally novel. And they have the best damn chicken wings in town. 604 South Street, Bella Vista, 215-925-3001. 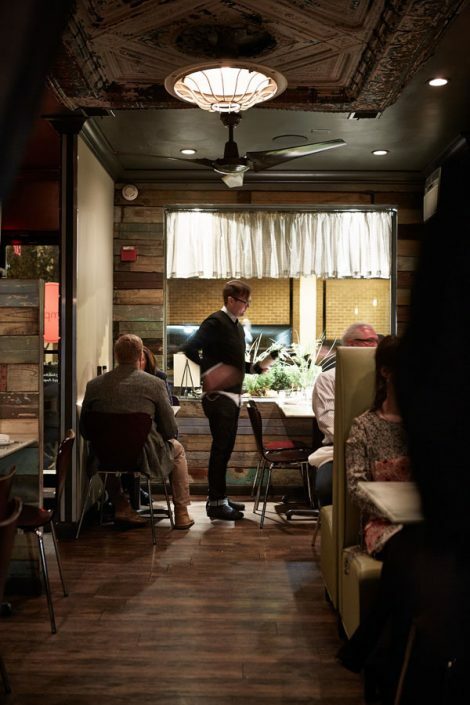 The ever-changing, occasionally bewildering modernist tasting menus in this old West Philly rowhouse are no longer quite the steal they used to be, but new chef- owners Andrew Kochan and Tim Lanza aren’t sitting on their old boss Robert Halpern’s laurels, either. Offering up the likes of habanero gnocchi with grilled pineapple in late summer and pumpkin bisque with cumin-scented popcorn in early fall, they infuse high-tech cooking with a seasonal focus that keeps Marigold rooted in the world where we all live and dine. 501 South 45th Street, University City, 215-222-3699. Late afternoon wine enjoyed outdoors at Fitler Dining Room. Cheu is less a restaurant than an ongoing restaurant-shaped experiment in how much awesome can be contained in a single menu. Push your way through the crowds, grab a seat at the counter, and just start eating-working your way through some of the most creative apps and divergent noodle bowls anywhere. Still not convinced? 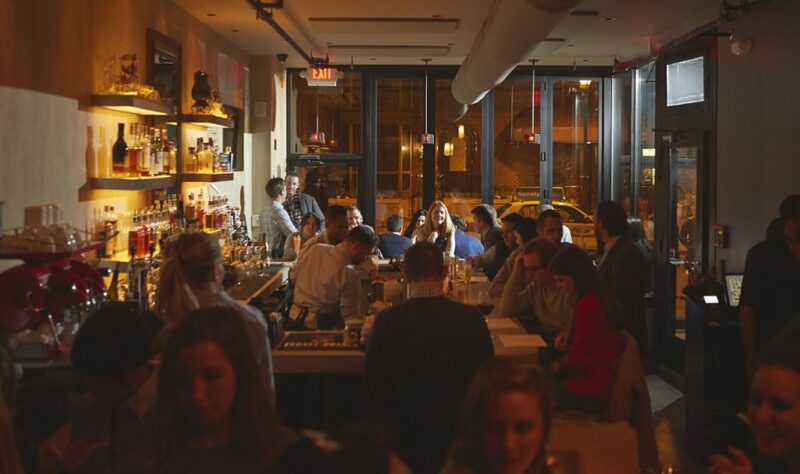 Then take it from the laundry list of chefs and food-world pros who, whenever they come to Philly, make sure they get a seat at Cheu before worrying about reservations at some of the city's more tony addresses. 255 South 10th Street, Washington Square West, 267-639-4136. With crispy lamb tongues on roasted turnips, smoked sable stuffed into giant cubes of challah, baharat-infused rum cocktails, and an unsurpassed salad spread running from apple-and-pomegranate tabouleh to tahini-drenched beets, Michael Solomonov continues to prove that Israeli cuisine has something for everyone: carnivore, vegetarian, bread lover and boozehound. 237 St. James Place, Society Hill, 215-625-8800. Chris Kearse hit the scene with dishes that were brilliant like disco balls: a thousand pencils of light flying in every direction. 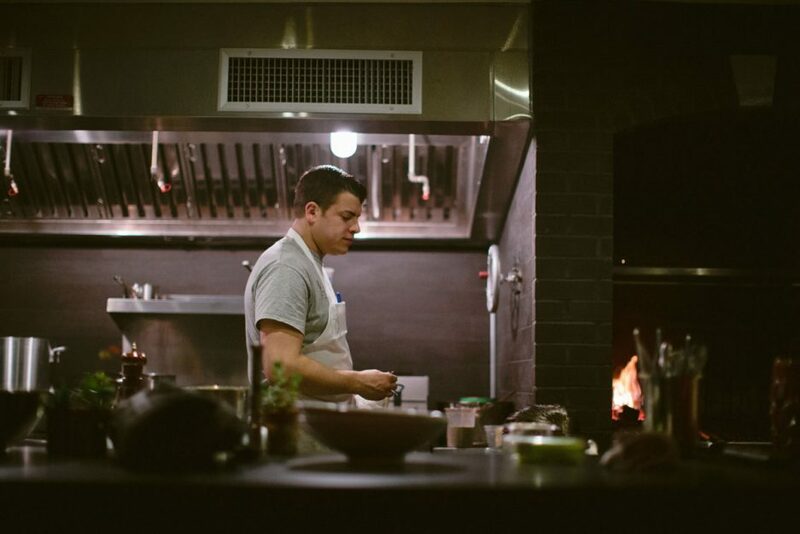 Two years in, he’s focusing those once-scattered beams into coherent rainbows of flavor. 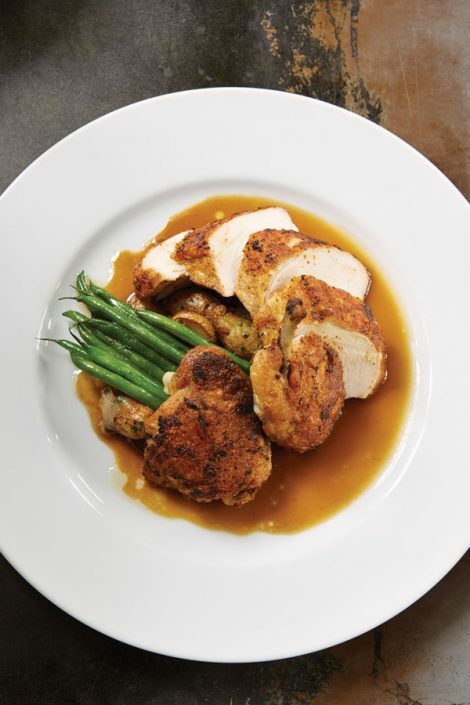 In other words, you won’t be bored by his chicken— butter-poached breast, thigh confit, liver mousse, skin transformed into an almost candied wafer, and a little tube of boudin blanc—but you won’t be confused, either. Just surprised and delighted— which is the whole point of modernist cooking in the first place. 1911 East Passyunk Avenue, East Passyunk, 215-271-7683. We can be honest here, right? Volvér has some issues. Serious issues. Issues with ticketing and reservations, issues with price, issues with a ridiculously inflexible menu that, ridiculously, was still serving garden peas in November as part of its 12-course tasting menu. And yet it speaks to the power of the crew assembled in this kitchen and the food they create that Volvér remains the kind of restaurant that regularly serves guests the best meal they’ll have all year—something it did for almost everyone involved in the creation of this list. It’s maddening to try to judge a restaurant with so much obvious talent and so many damning problems. The only thing worse? Sitting here and wondering why the chefs or owner can’t simply repair those things that need so badly to be fixed. 300 South Broad Street, Center City, 215-670-2303. 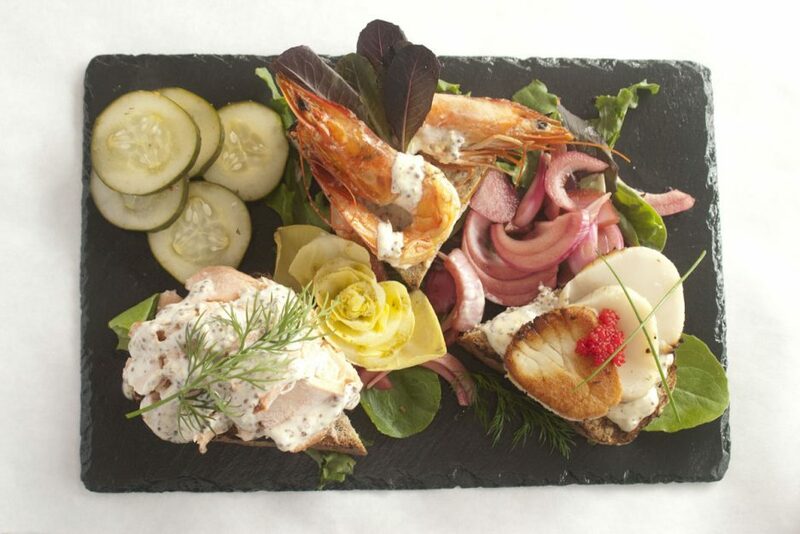 The word “enchanting” was invented for BYOs like Bibou. Everything from its size (teeny!) to the servers (attentive, affable, some of them even French) to the smart, unfussy execution of rustic French classics (tender lamb inside a cloud of puff pastry with buttery-soft foie gras; a delicate but deeply satisfying pot de crème) continues to feel special—magical, even—five years in. 1009 South 8th Street, Bella Vista, 215-965-8290. 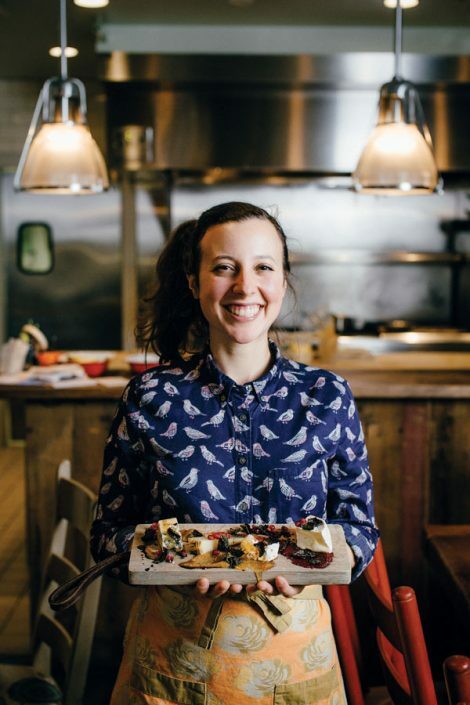 That food this chef-y comes from a restaurant this neighborhood-y is what makes Philly’s dining scene so awesome. The appetizers here are where chef/owner Lee Styer seems to have the most fun, with pork rillettes (think sausage patties that are crisp and delicate), duck hearts, scallop ceviche and boar pâté, while classic entrées (a simple roasted chicken, a delicious skate wing) are flawlessly executed. 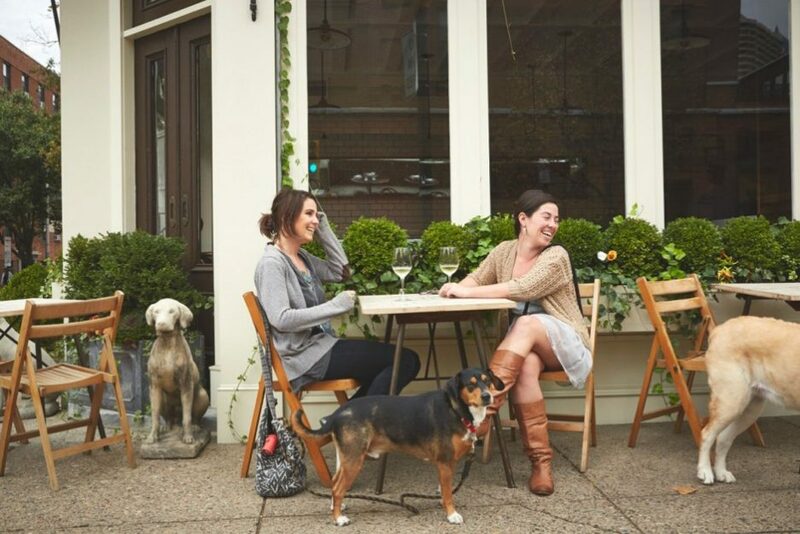 1537 South 11th Street, East Passyunk, 215-551-5000. 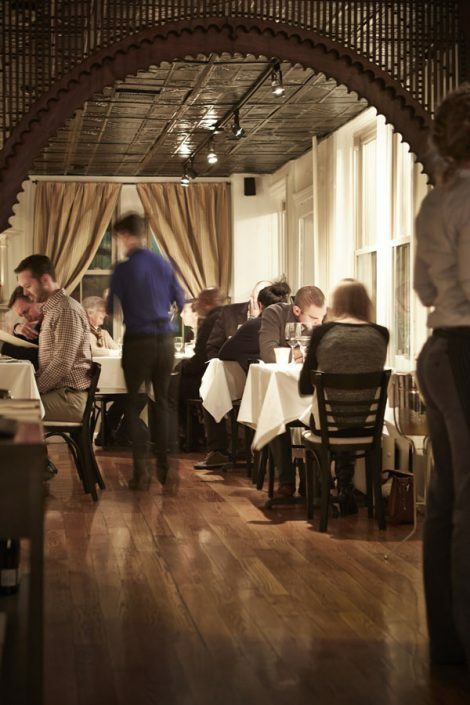 Amis has always been a solid restaurant—more casual than Vetri, but with a staff that was just as precise and an Italian menu that felt at once less traditional and more restrained. But what truly elevates the experience here are all the things Amis does that Vetri doesn’t, from simple, comforting tastes like a piece of perfect buffalo mozzarella with black pepper to complicated, epic departures like the Beast of Amis menu—an ever-changing menagerie of whole animals utilized in the nose-to-tail style, always offering something surprising and new. 412 South 13th Street, Midtown Village, 215-732-2647. Start with the antipasto Siciliano. It’s like ordering a Sicilian culinary lesson. Then try a pasta, close your eyes, and enjoy visions of Italian coasts. Order the whole fish next, and look around to thank the fisherman who brought it into port that day. You won’t find him, but do thank chef Joey Baldino, who gave you the wonderful trip to Italy for the price of a bridge-crossing. 618 Collings Avenue, Collingswood, 856-854-2670. High Street is to Fork what your mistress is to your wife: lots of fun with less responsibility. Yes, it’s known for its cafe day service. Yes, it has some of the best breakfast sandwiches in this country. And yes, the bread’s as good as you’ve heard it is. But dinner is where they really show off. 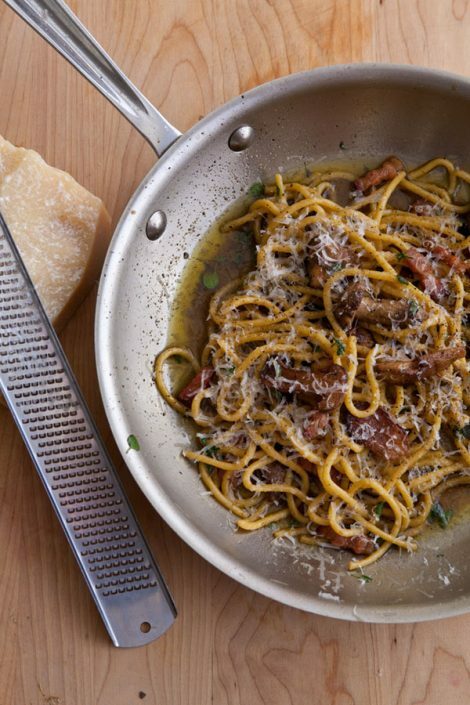 It’s a small-plate house-made-pasta heaven with local bounty galore. If you’re overwhelmed by the sheer number of choices, just sit back, close your eyes, and let them cook eight courses for you—that option’s on the menu. 308 Market Street, Old City, 215-625-0988. This is the kitchen where chef Joe Cicala grew up—where he came into his own as a chef with its exploration of Abruzze cuisine and the myriad possibilities inherent in a plate of pasta. This is also where eaters in this pasta-mad city come for historical explorations played out in food, and the kind of comfort that comes from finding not just a dish or two worth returning for, but an entire menu that makes you want to move into the neighborhood so that another dinner here (and another, and another) is never more than a few steps away. 1927 East Passyunk Avenue, East Passyunk, 215-271-5626. The food is textbook—French onion soup, steak tartare, boudin noir—but a thousand times lighter, fresher and more appealing than Escoffier (or even Julia Child) could have ever imagined. The elegant service and pleasant dining room follow suit. Le Chéri doesn’t need the flash of other newcomers to the scene, because the menu has the consistent high-achieving, finish-every-bite goods that any other restaurant would kill for. Oh, and if you see the throwback Dover sole special on the board, it’s worth every penny. 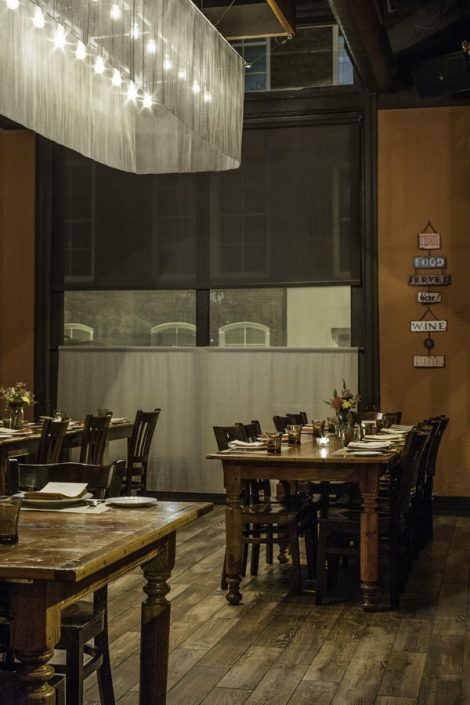 251 South 18th Street, Rittenhouse, 215-546-7700. If Sbraga (eventually) proved that Kevin Sbraga wasn’t going to let celebrity chef-dom go to his head and that he could consistently produce modern New American cuisine with the best of them, Fat Ham stands as proof he hasn’t forgotten the roots of American cuisine. His ode to the New South presents a brilliant, crave-able version of that hipster-bait food, done smarter than anyone else and with a sharper focus. He doubles down on grits with two different versions of the iconic Southern starch, makes hummus of boiled peanuts, makes highbrow sport of lowbrow pimento cheese, and serves a hot chicken so virtuous, it ought to come on a paper plate and with its own picnic table—the ultimate compliment for poor-boy food made good. 3131 Walnut Street, University City, 215-735-1914. 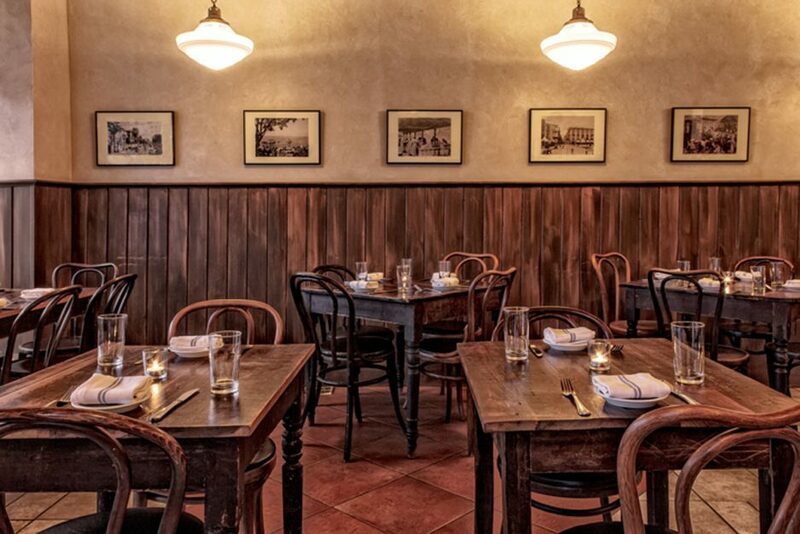 The original outpost of Marc Vetri and Jeff Michaud’s beloved Italian restaurant gets major points for still turning out food executed at least as well as it was almost eight years ago, when this place first opened. You simply will not find better service or an Italian menu more appealing and accessible on every level anywhere else in the city. 640 North Broad Street, Spring Garden, 215-763-0920. 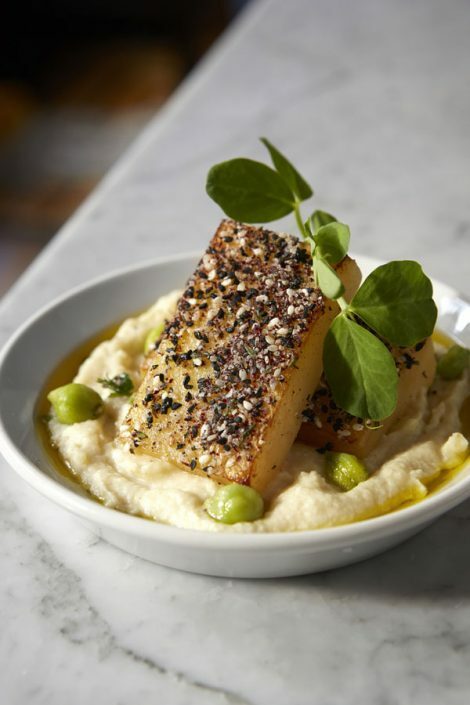 Selling us on sashimi-style radishes or “edible soil” is bush-league compared to what chef Yehuda Sichel pulls off at Michael Solomonov and Steve Cook’s return to Jewish cuisine: a gefilte fish that actually made our mouths water for seconds. Add ravioli-style kasha varnishkes and a blockbuster smoked short rib, and you’ll never look at Ashkenazi food the same way again. 1623 Sansom Street, Rittenhouse, 215-867-0088. Josh Lawler is one of several wandering Philadelphia chefs who have recently come home to open their own restaurants, and the city is better for it. Lawler takes farm-to-table seriously (it helps that the kitchen doesn’t even have room for a freezer) and clearly has strong relationships with local farmers. And why wouldn’t a farmer want Lawler to serve his or her meat and produce? Each dish is an advertisement for buying fresh and local. 1120 Pine Street, Midtown Village, 215-267-1555. 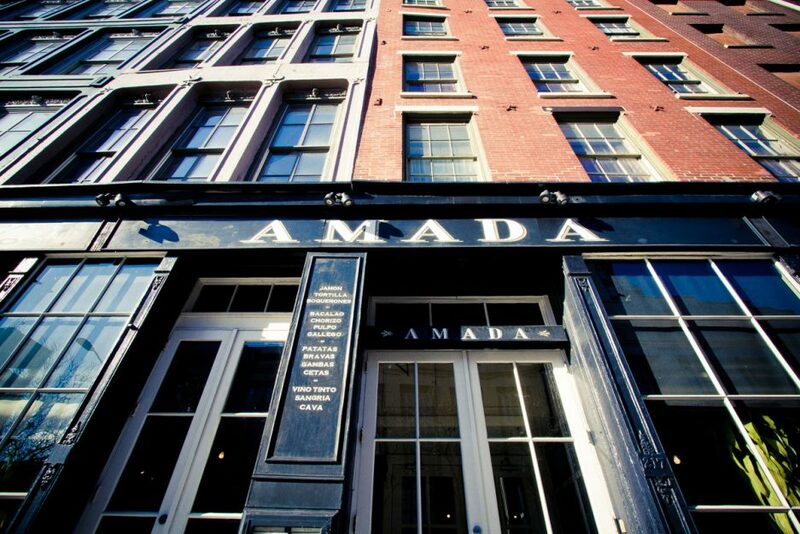 The vast menu at Amada reads like a greatest-hits list of all the tapas Philadelphia first flipped for almost a decade ago, and the kitchen pumps them out with impressive aplomb. The service and expert wine guidance keep Jose Garces’s first restaurant firmly cemented as a special-occasion destination and not just a class in Tapas 101. 217 Chestnut Street, Old City, 215-625-2450. 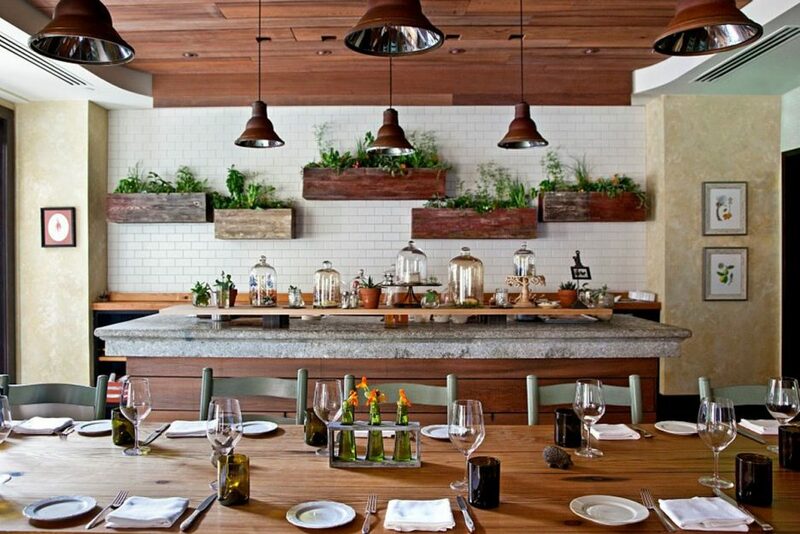 The farmhouse setting, the garden, the almost museum-quality New American menu with its charming French and Italian accents, and the long, carefully curated cheese list—sitting down for dinner at Talula’s Garden is like crawling inside chef Aimee Olexy’s head, or spending a year perusing her private cookbook collection. 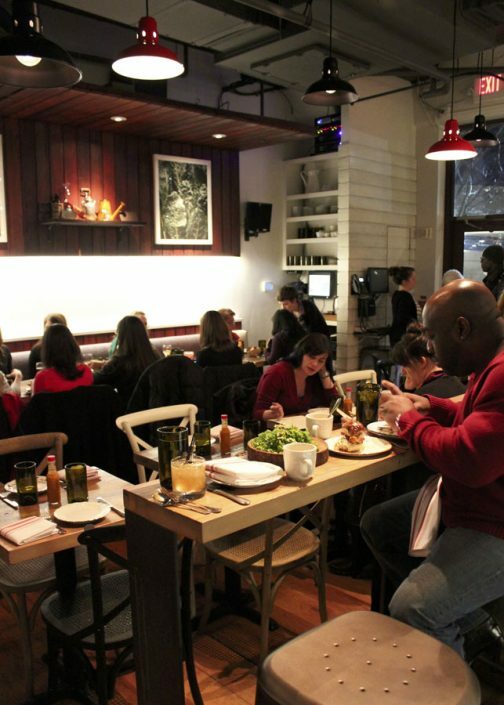 All restaurants, to a certain extent, are expressions of the chefs who operate them, but Olexy’s largest and most approachable space, with its whole roasted porgy, mustard green salad with apples and parsnips, and “Little Vegetable Dishes,” stands as a charming comment on the history of New American cuisine and Olexy’s place in it. 210 West Washington Square, Washington Square West, 215-592-7787. Daily is Aimee Olexy’s scaled-up version of Talula’s Table, for city slickers. The cafe-by-day changes just enough for nighttime service: Display cases are covered; the lights are expertly dimmed. 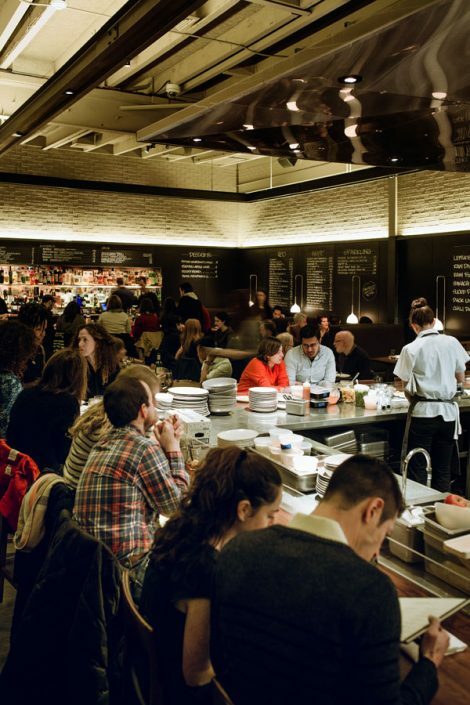 As at Kennett’s Table, your meal at Daily isn’t so much served as chaperoned by an Olexyite. 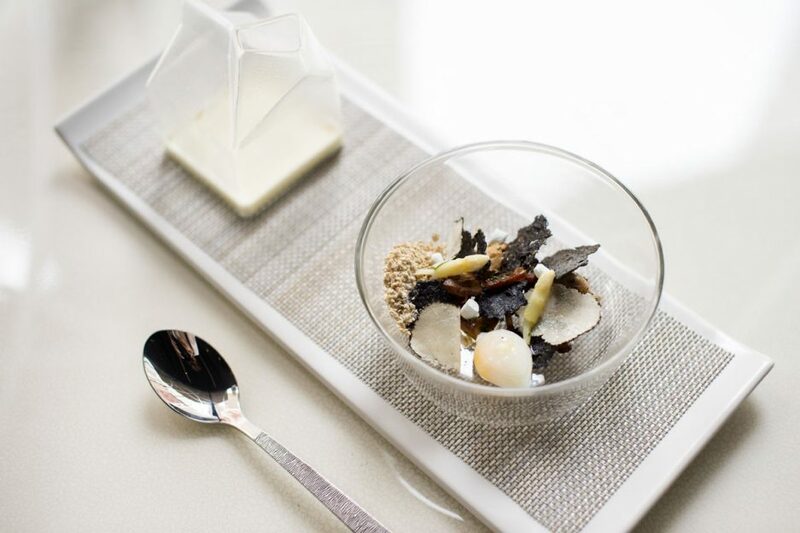 The singular menu changes monthly, the beverage pairing is a must, and the experience is always worth savoring. 208 West Washington Square, Washington Square West, 215-592-6555. The tables are pushed too close together, conversations fuse into a communal clamor, and you can barely wiggle a toe without tripping a waiter. 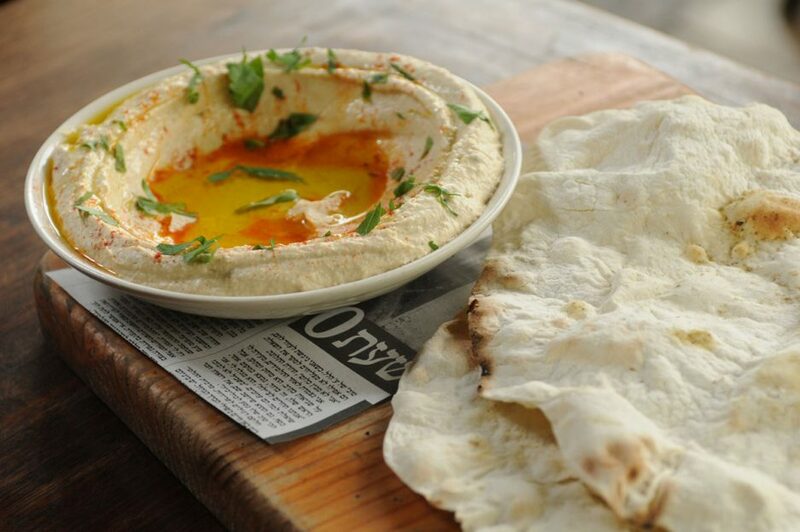 But one soulful bite of Konstantinos Pitsillides’s roasted goat with date chutney, or Armenian flatbread with lamb and eggplant, or absolutely anything roasted in grape leaves (especially whole fish), will make you wonder if you’ve walked through a wormhole to his native Cyprus—and if there’s any way to avoid ever going home. 1001 Spruce Street, Washington Square West, 215-922-1773. 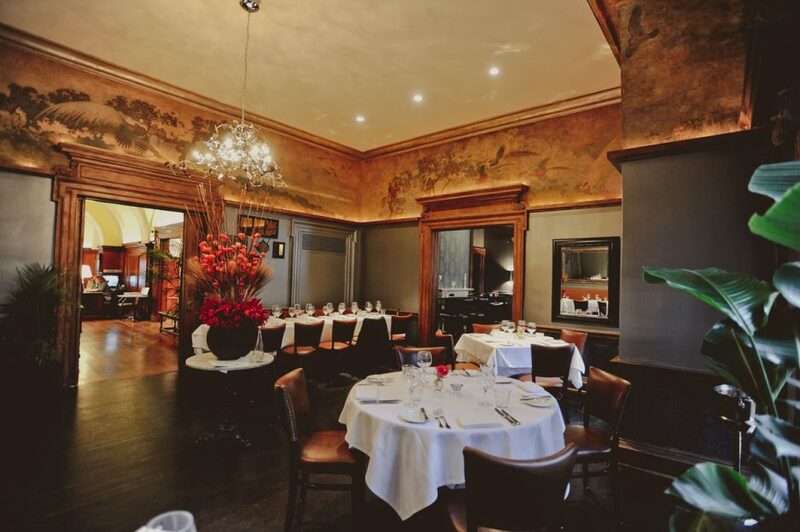 In past incarnations, A.Kitchen was never really anything more than a fancied-up hotel restaurant with good street frontage that made it feel like more than just a hotel restaurant. But now, under the command of Eli Kulp, it also tastes like more than just another hotel restaurant. The service is smooth. 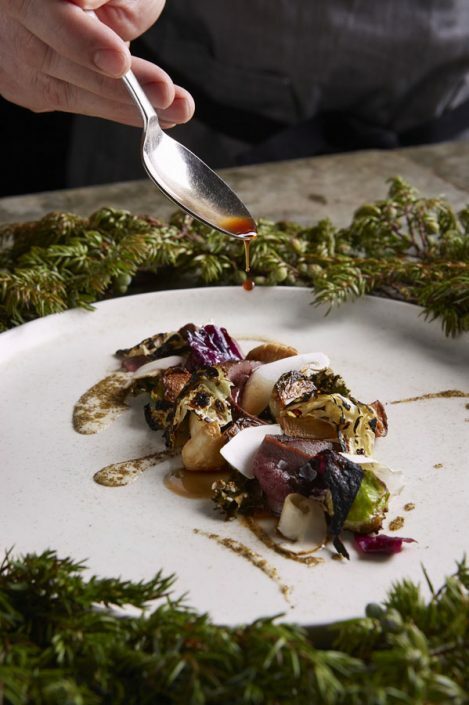 The fine, restrained touches of modernism in the prep and plating of dishes like the potato soup and charcoal scallop with pomegranate, chili oil and kimchi consommé elevate the cuisine without making it intimidating. 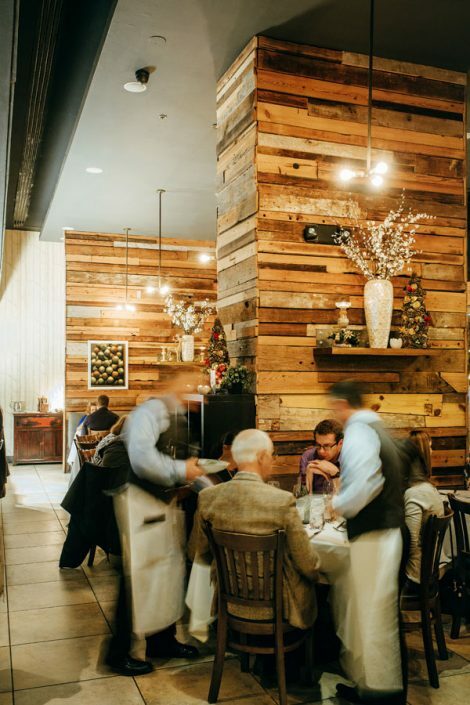 And the dining room—particularly when they have that big wood-burning grill going—is one of the best-smelling spots in the city. 135 South 18th Street, Rittenhouse, 215-825-7030. If you think you don’t like sherry, drink it at Jamonera. You might change your mind. If you think the small-plates fad has already peaked and cratered, spend a night at Jamonera’s bar, or tucked into one of the tables on its claustrophobically close floor, and see if you still feel the same way by the time the third flight of tapas arrives. 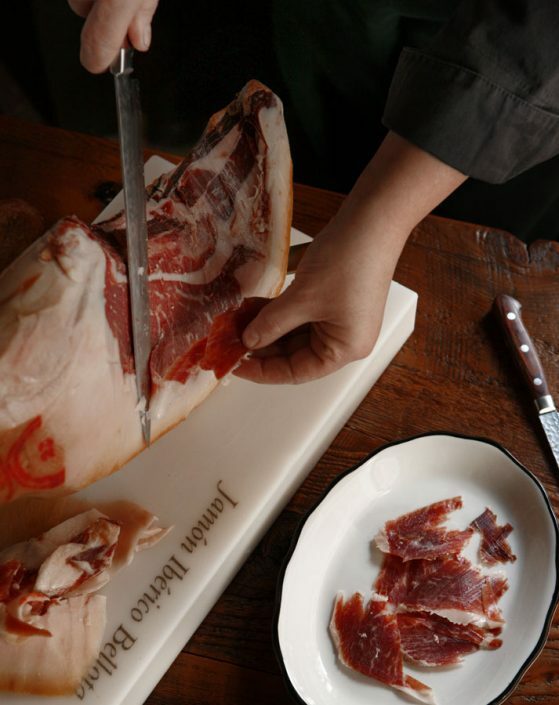 The most impressive thing about Jamonera is that any single section of the menu (the toasts, the seafood, the cured meats and cheeses) can serve as an entire meal with barely a dud in the bunch. And getting to sample all of these takes on the Spanish small-plates trend, all in a single sitting, feels like a gesture of generosity rarely seen at more rigidly canonical restaurants. 105 South 13th Street, Midtown Village, 215-922-6061. Gone: opening chef Jonathan Adams and his highly touted burgers. In his place is chef Eli Collins and a double- pattied traditional burger—and you can’t even choose the degree of done. It’s an excellent burger, but no longer the singular star of the menu. Instead, get down with whiskey sage bread, the gnocchi (really gnudi), and any entrée that strikes your fancy. 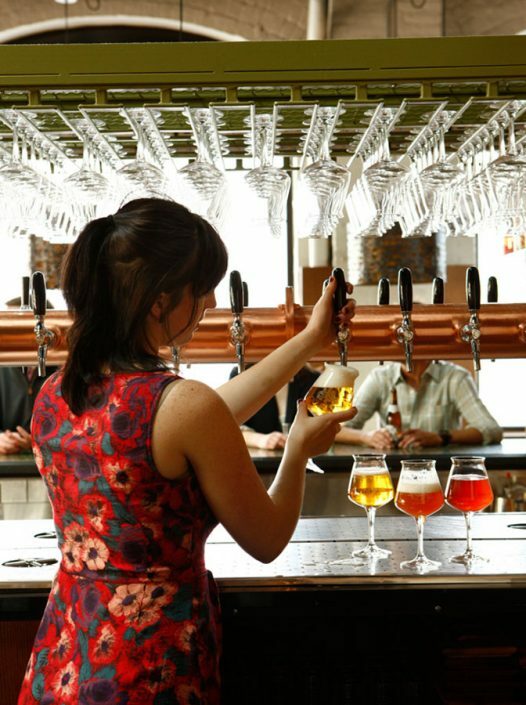 Pub & Kitchen is all grown up now, and it has become a great place to eat and drink. 1946 Lombard Street, Rittenhouse, 215-545-0350. 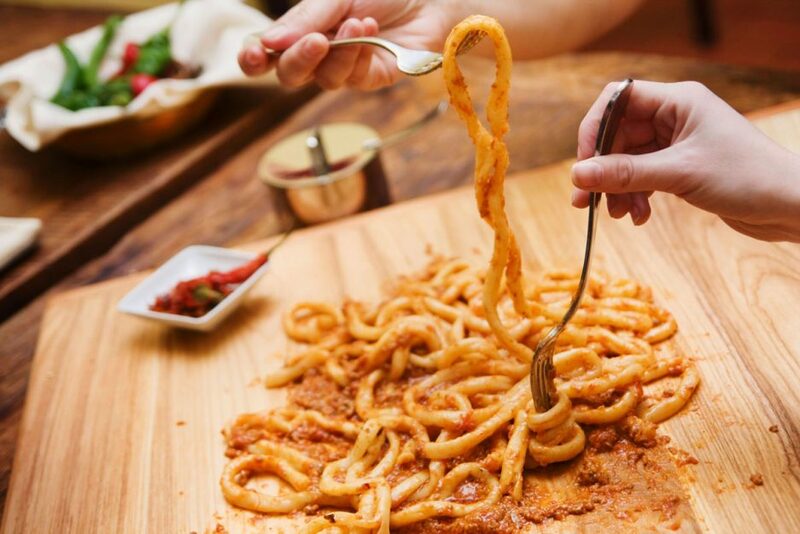 It’s all about the chew at Chris Painter’s special-occasion Italian restaurant: His homemade pastas swagger with more al dente spring than most, while his deeply savory braised meats all but melt around the edges of your tongue. And whether it’s complimentary wine taste-tests or a surprise after-dinner amaro to make up for some nearly invisible misstep, the service doesn’t aim so much to please as to spoil. 2025 Sansom Street, Rittenhouse, 215-391-4900. 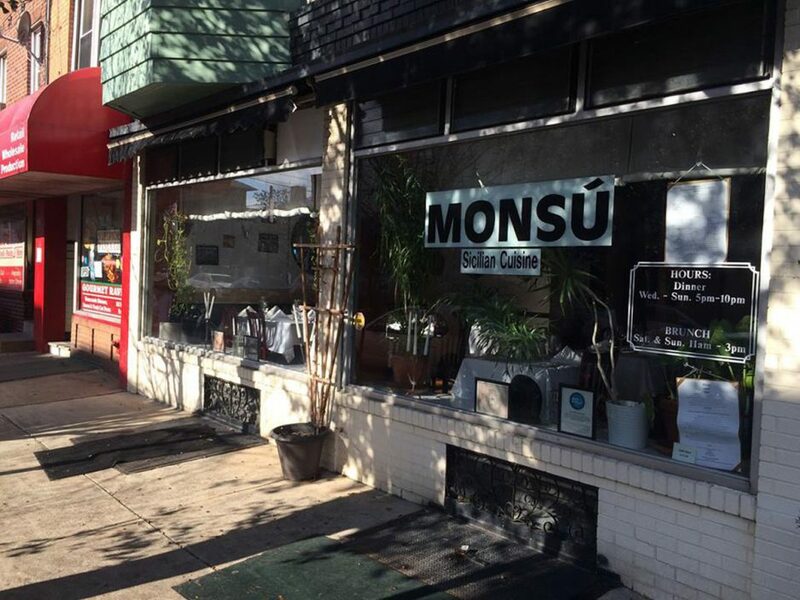 Some restaurants take months to find their soul; Monsú took a few years. 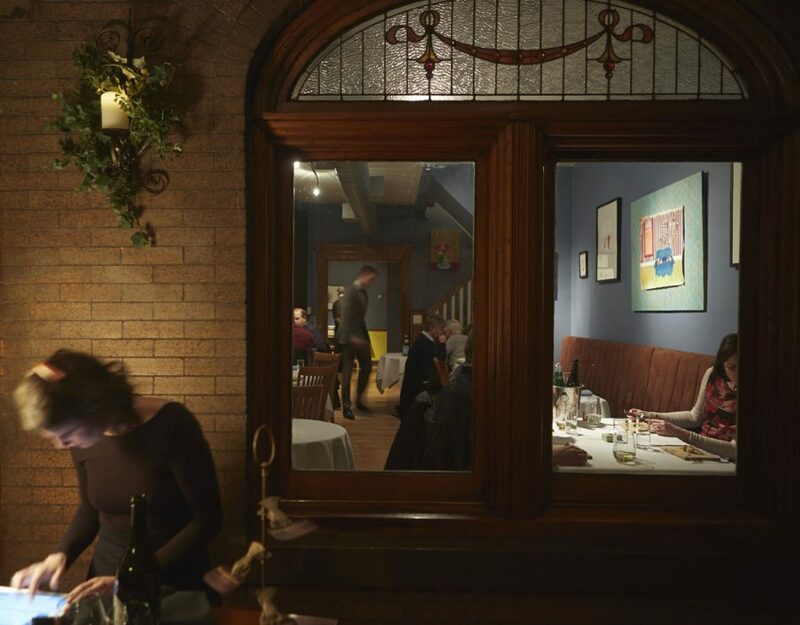 But it was worth the wait: The romantic lighting, the genuine waiters, and the authentic South Philly Italian BYOB vibe have a throwback appeal that makes you want to linger over another bottle of wine, another laugh, another plate of artful pasta. Definitely start your meal with the antipasti bar, where the dozens of seasonal dishes (marinated veggies, salumi, fish) are as pretty as they are delicious. 901 Christian Street, Bella Vista, 215-440-0495. 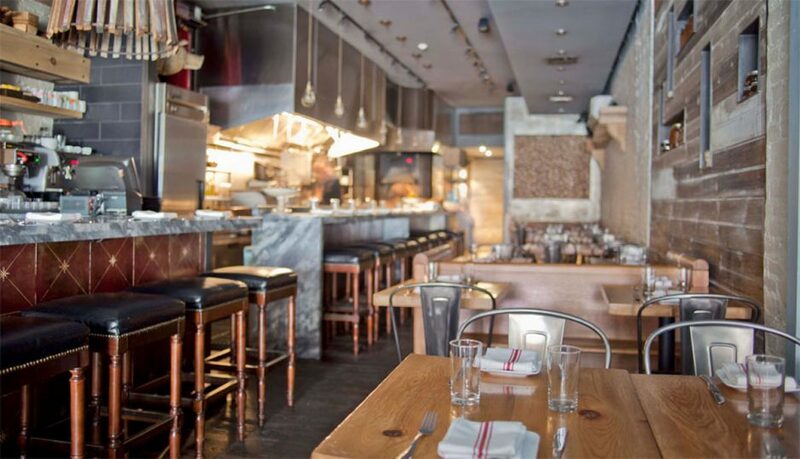 Yes, Alla Spina is a Marc Vetri restaurant, but it’s very much a bar and works best when diners treat it as such. Ignore all expectations and order the pretzel bites, chicken wings, and a pork Milanese hoagie or mortadella hot dog. Cheer on your favorite Series-A Italian soccer squad and enjoy an Italian or American craft beer. It really is just as simple as that. 1410 Mount Vernon Street, Spring Garden, 215-600-0017. 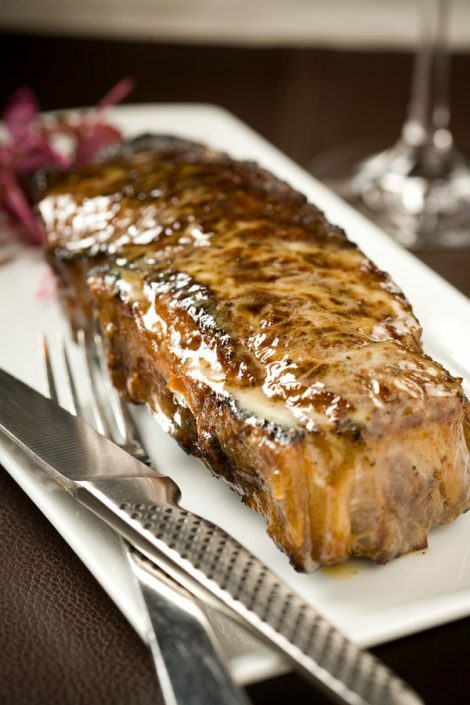 Sometimes you just want a giant, bleeding hunk of prime dry-aged beef and a fantastic wine to go with it. When you do, go directly to Barclay Prime and nowhere else. 237 South 18th Street, Rittenhouse, 215-732-7560. 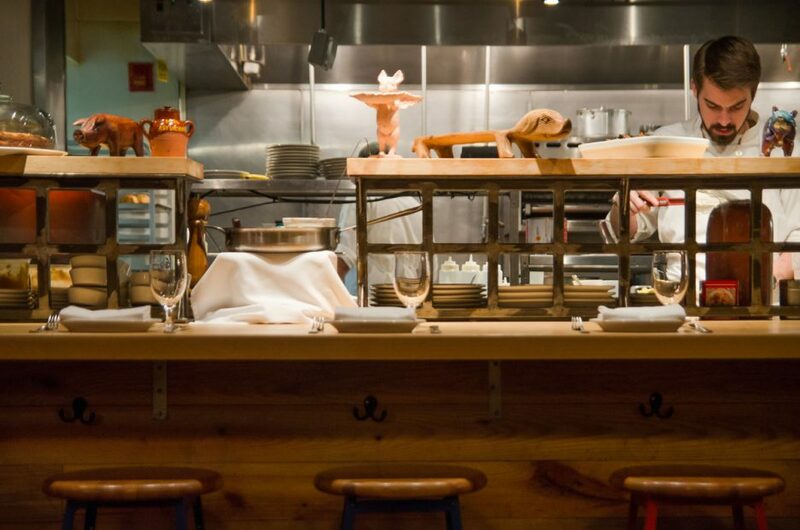 As the name implies, Little Fish is indeed small and does focus on seafood. 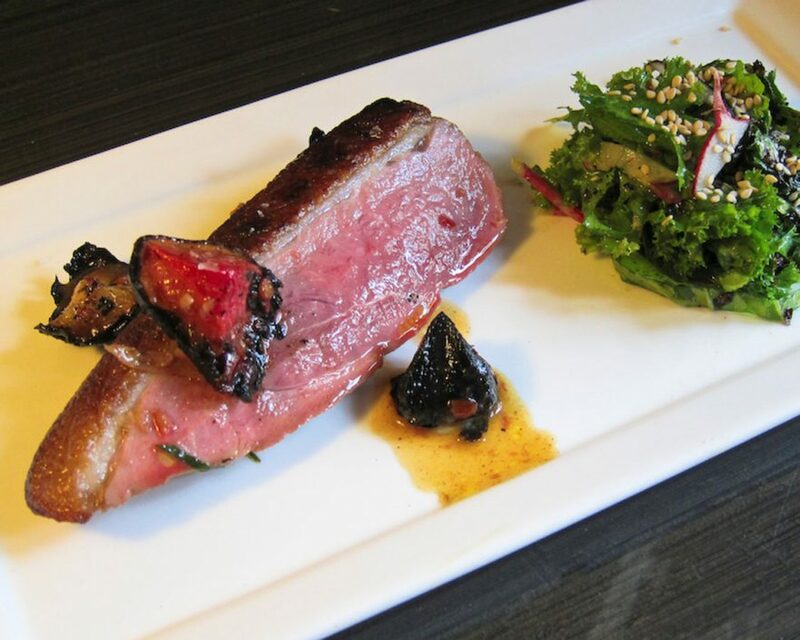 But where the restaurant truly shines is in combining surf with turf in imaginative ways that run circles around any groaning steak-and-lobster tropes. Offerings like braised lamb and octopus elevate both proteins. 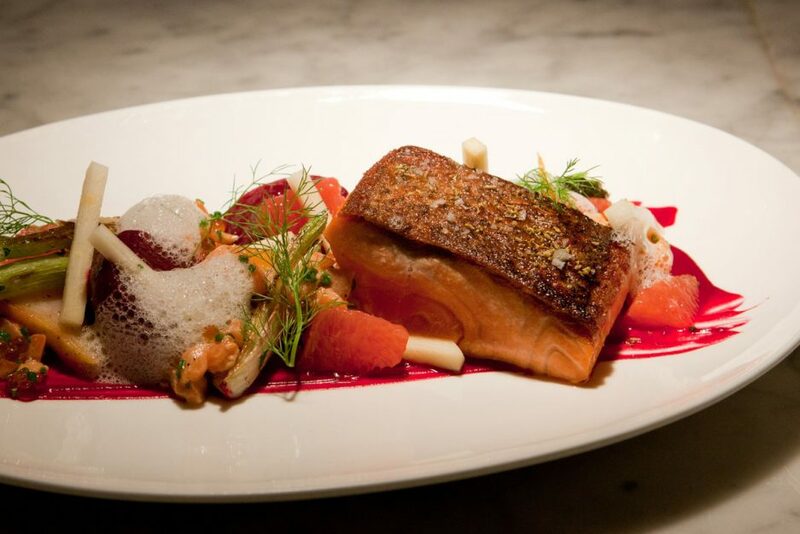 And even when it is just fish on the dish, the accompaniments, like the sea trout’s carrots, lentils, chanterelles and shishito peppers, really bring the wow. 746 South 6th Street, Bella Vista, 267-455-0172. Andrew and Kristin Wood’s Old World approach to farm-to-table cooking was distinguished from the outset by the former’s house-cured meats and the latter’s deft pastries. What’s taken a little longer: packing their daily-changing menu with sufficient variation on any given night. 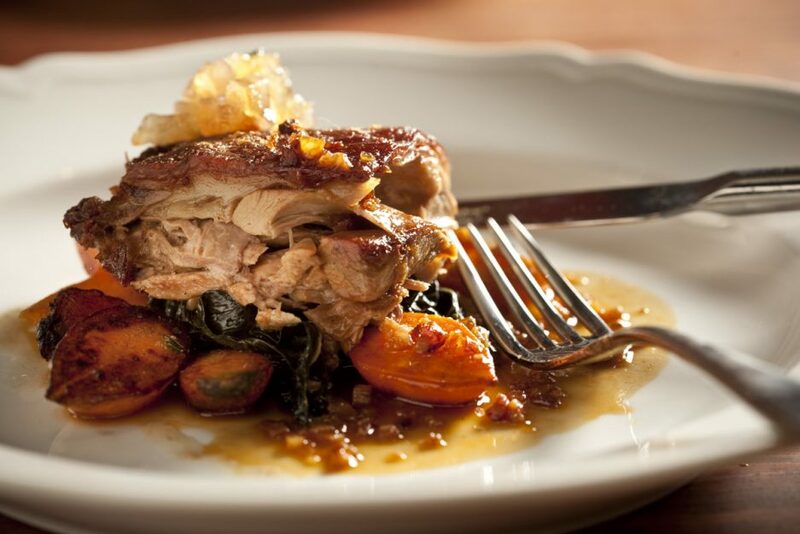 From delicate stinging nettle sformato to hearty roasted lamb leg, they’ve now achieved full fluency with the classic canon and earned their place as one of the best restaurants in Philly. 1521 Spruce Street, Center City, 215-546-1521. 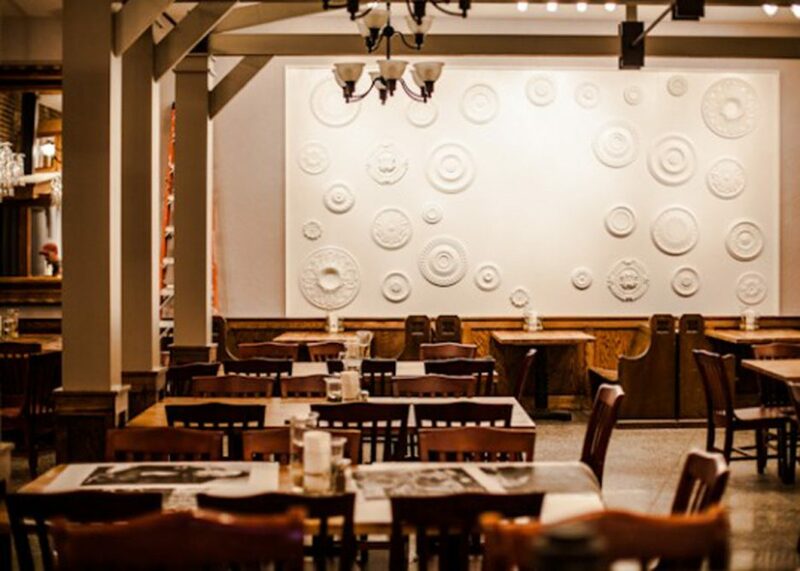 Barbuzzo is always the same: always comforting, always satisfying, always there for you when you’re looking for the particular things—a great meatball, sweet caramel budino, wood-fired pizza or a warm bar on a cold afternoon—that it does so well. While it isn’t the stunner it once was, it is just as crowded as ever, speaking to the power of a restaurant that knows what it’s good at and is disciplined enough to keep on doing it. 110 South 13th Street, Midtown Village, 215-546-9300. Nobody burns wood more deliciously than Justin and Jonathan Petruce. Whether they’re cranking the height-adjustable grates of an Argentine-style grill to give lamb breasts a BBQ-like bark or roasting carrots for a dynamite cooked/pickled/raw salad, they coax intense depth from everything the flames lick. And Tim Kweeder’s wine list is the next best thing to a motorcycle tour of the gnarliest garagistes from Spain to Slovenia. 1121 Walnut Street, Midtown Village, 267-225-8232. There’s our admiration of fancy food, and then there’s our proclivity for all things casual. Ela sits somewhere in that Venn diagram intersection. 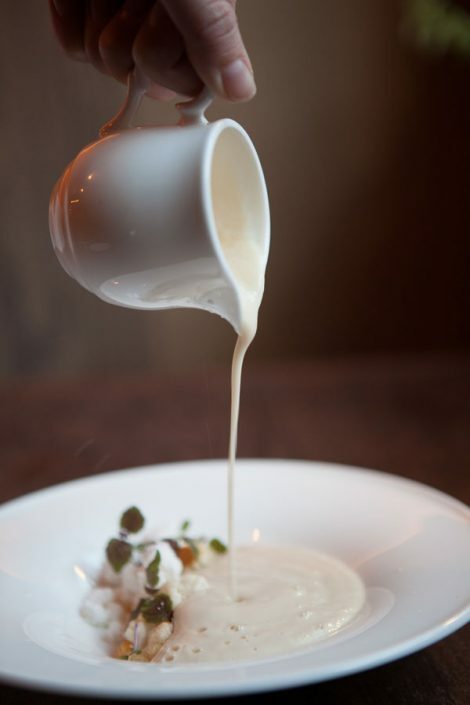 Jason Cichonski, as chef and co-owner, has finally found his groove: serving up the food that he does best— classic techniques, attention to detail, top- notch ingredients, with just a twist of clever—in his moody resto-bar. Nowhere else in this city will you get lobster banh cam with pickled fennel and an Earl Grey sauce plated on crisp china in a super-cool neighborhood spot. 627 South 3rd Street, Queen Village, 267-687-8512. Chef Scott Schroeder has been taking some chances with the menu here (going to an ever-shifting chalkboard list; adding a bunch of well-considered vegetarian options), and his risk-taking is paying off in a restaurant that feels a lot cooler and more rooted than any simple “gastropub” label might describe. Headcheese and wild boar tacos, rare cheeseburgers with beer-braised bacon, and fried chicken skewers with collard greens share space with a plate of local grilled broccoli, a kale and apple salad dosed with fresh horseradish, and a fried PB&J sandwich for dessert. 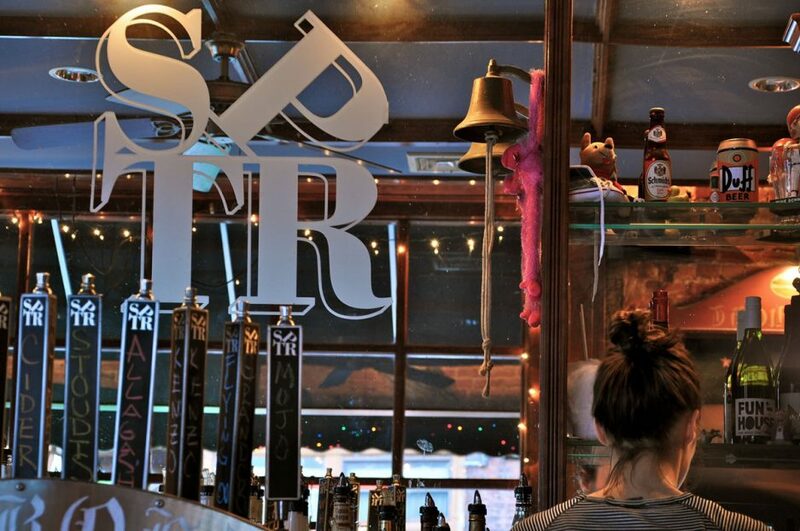 This is a smart, modern take on the Philadelphia pub menu, and things at SPTR just keep getting better. 1509 Mifflin Street, Point Breeze, 215-271-7787. With its broad windows backing a bar whose tapered curve suggests a tugboat steaming toward the Singing Fountain, this nouveau whiskey boîte remains ground zero for Passyunk Avenue’s cocktail hour—where a thirst for liquid surprises (like gin with Breckenridge amaro and rhubarb liqueur) goes hand-in-hand with a hunger for edgy fare from the kitchen. 1536 East Passyunk Avenue, East Passyunk, 215-551-2500. There’s the pizza, of course. Blistered, weightless yet bold, oh-my-God-I-just-ate-a-whole-pie good. 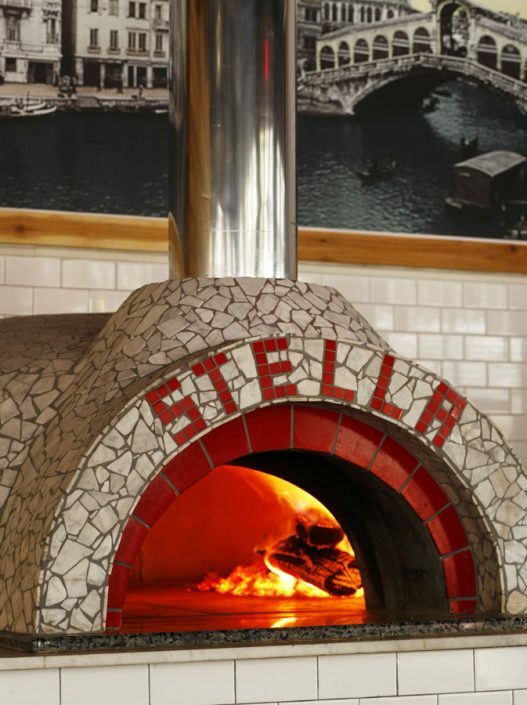 But as this Headhouse restaurant eases into its sixth year, it’s the other things that take Stella from solid pizzeria to stalwart eatery: a small menu of hand-rolled pastas perfect in their simplicity, salads with memorable compositions (baby kale leaves with crispy artichokes and a tonnato dressing), and the calzone that redefines all calzones everywhere. 420 South 2nd Street, Society Hill, 215-320-8000. You might think you’re just getting beer and tacos, but chef/partner Adan Trinidad is serving elevated Mexican fare. From the raw bar to the ceviche to the “from sea” tacos, Trinidad shines. His talent is even obvious in the hard-shell tacos, which at Sancho’s are house-made, served with addictive Kobe beef, and on special during sporting events. Make no mistake—Sancho’s is a bar first. But it’s also a restaurant we should all be taking more seriously, because the food is no joke. 19 West Girard Avenue, Fishtown, 267-324-3530. Chef Jeremy Nolen does modern German food as though nobody has ever told him that no one should try cooking modern German food. And the crowds that pack this place (for the beer, sure, but also for the stopfleberwurst and the rahmschwammerl) certainly don’t seem to care, either. 718 South Street, Bella Vista, 267-909-8814. 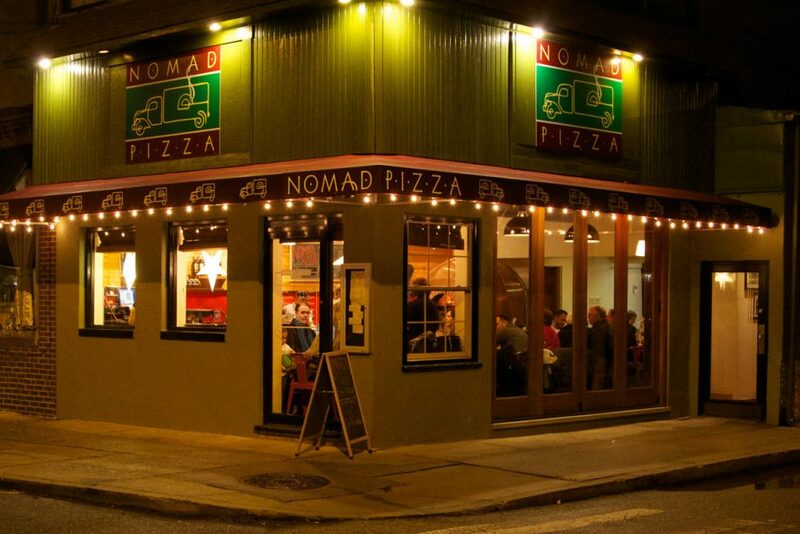 Nomad keeps it simple, but far from stupid. The margherita and marinara pizzas are close to perfection just as they are, but the addition of toppings like spicy soppressata and the affordable wine make this Philadelphia’s best pizzeria. 611 South 7th Street, Bella Vista, 215-238-0900. 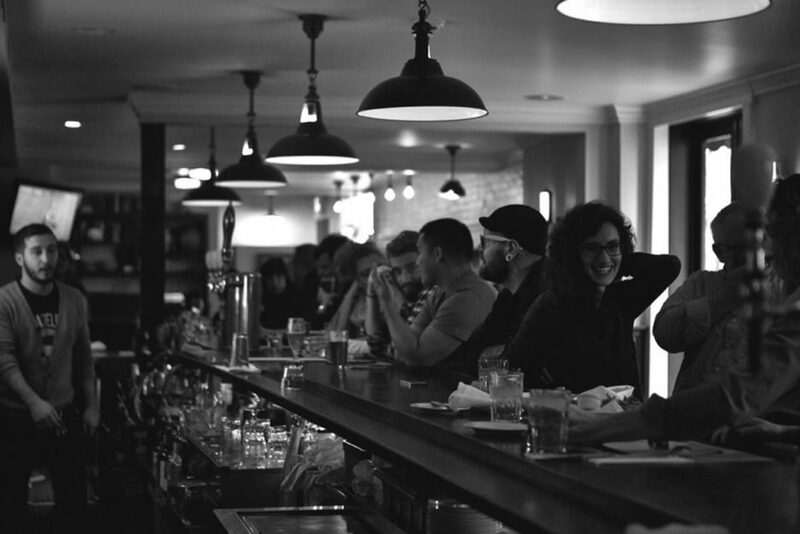 The Center City Indeblue ups the ante with a liquor license and an attractive space that’s a world away from the Collingswood original. What hasn’t changed is chef/owner Rakesh Ramola’s execution of South Indian classics. Try the spicy scallops and raiwala shrimp skewers, but don’t fear Ramola’s twists on classics, like the spare-rib samosa rolls with blue cheese sauce. 205 South 13th Street, Midtown Village, 215-545-4633. Joncarl Lachman suffuses the frostbitten cuisines of the North Sea with a personal warmth that’s rare in these days of absentee celeb chefs. His smoked fish is a must; ditto the soulful mustard soup with scallops and a confit rabbit in lip-smacking Dutch sauerkraut. But what’ll stick to your ribs longest is the fuzzy feeling he drapes over every table. 1046 Tasker Street, East Passyunk, 267-909-9704. * New to the list. Written by Art Etchells, Victor Fiorillo, Christine Speer Lejeune, Trey Popp, Ashley Primis, Jason Sheehan, and Alex Tewfik. Originally published in the January 2015 issue of Philadelphia magazine.